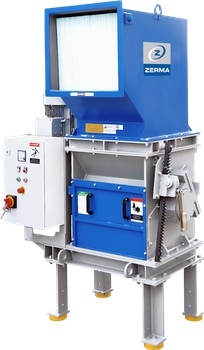 The ZBS shredder has been developed as an economical alternative to the ZSS shredder range. The main application is shredding, prior to granulating, of small lumps commonly accrued in injection processes during color changes & start up. The machine is fed via a double walled sound dampening hopper which can be turned in 3 directions to easily adapt to existing installations. Different material discharge options are available e.g. open outlet to feed into bins, suction troughs to connect to a blower system, direct transfer into another machine or onto a conveyor. Hopper & discharge design can be tailored to accommodate specific needs. The cutting chamber is designed with a strong tangential in-feed thus eliminating the need for a hydraulic feeding system. The 310 mm diameter 'E' style rotor which is directly driven by a heavy duty geared motor ensures smooth operation.